I've kept things really quick and easy for today's creation using the Perfect Blend stamp set from Stampin' Up!, and the card literally took just minutes to create using colors that are so appropriate for the stamp set, Early Espresso ink and Crumb Cake and Very Vanilla card. Labels: CAS, Perfect Blend, Stampin' Up! This is really cute Em! 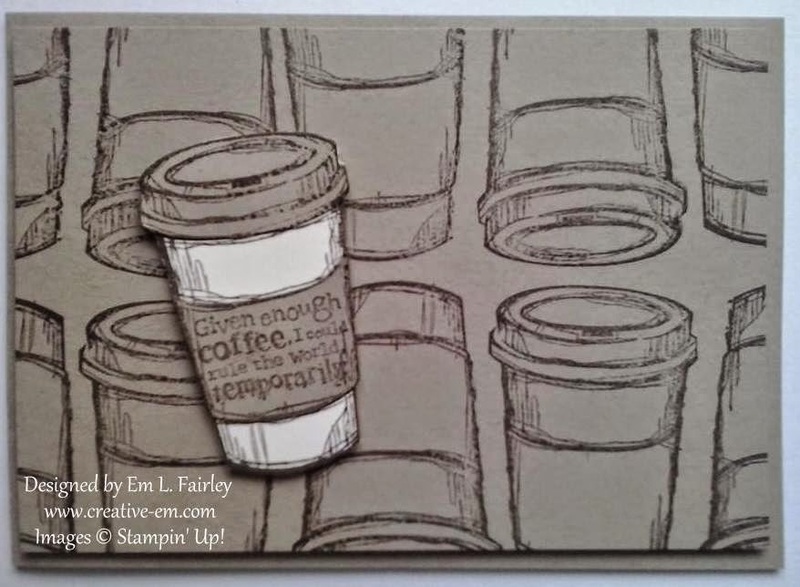 My Husband is a coffee addict ... will have to remember this a birthday card! Another great card and love the colour too. Great card! And this is me too, a big coffee drinker! Can't start my day without it. Again, thank you so much for the lovely birthday card and gift. You definitely made my day! I gave you a "shout" out on my blog. GREAT job on this muted tone design! The colors are warm and inviting! Very artistic, too! Thanks so much for playing Simon Says Stamp Wednesday “Anything Goes” Challenge! You already know I love the sentiment and that "coffee first - Talk later" is my morning motto. LOL. Of course I love this card.